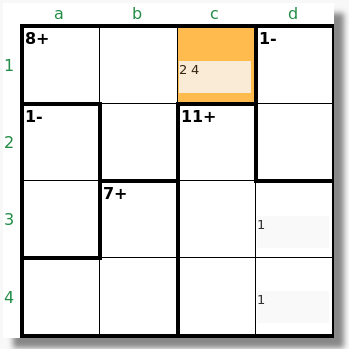 Calcudoku puzzle forum - View topic - good analytical solution for a specific 4x4 difficult? good analytical solution for a specific 4x4 difficult? Re: good analytical solution for a specific 4x4 difficult? - both a2a3 and d1d2 have to be 3,4.
but never considered "40 - '+ cages'"
Same line as jaek, you can only have a total of 14 for both cages "1-" with the "maximums" [3,4] in both cages simultaneously, btw it's very frequent to add all cages in this type of 4x4's. Then, since 8 + 7 + 7 = 22, i.e., the excess over the sum of the two leftmost columns gives c1 = 2. Now, since a2 + c2 = 5 (two upmost rows: 20 - 8 - 7) and a2 = 2, c2 = 3 is not valid because a 2 is not inside cage "1-" in a2-a3 ... it must be a2 = 4, c2 = 1 and the rest of the puzzle is immediate. Thank you jaek (as well as clm) as I used your method on today's puzzle and solved it quite quickly......in the past, these have been very bothersome for me and usually take in excess of 5 minutes to solve if I don't get a lucky guess with which to begin. I was able to solve the yesterday's 6x6 using the same type of logic you presented for the 4x4 and once again a puzzle that would cause me to take a lot of time was solved quickly....thanx again.